THE LYRIC MAGAZINE See what's happening at The Lyric! VISIT STUART We know you Love the Lyric! Fall in love with Historic Downtown Stuart. "To provide the community with a home for the performing arts that entertains, educates, and stimulates the growth of artistic integrity and experience for everyone." 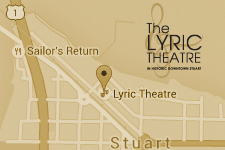 The Lyric Theatre, a not-for-profit 501c3, is made possible by the support of your tickets and your generous donations.